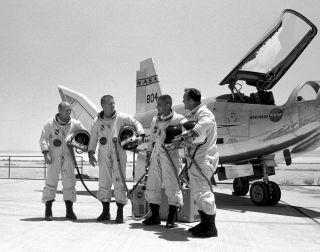 HL-10 pilots (left to right) Air Force Major Jerauld R. Gentry, Air Force test pilot Peter Hoag, and NASA pilots John A. Manke and Bill Dana. The HL-10 was one of five lifting body designs flown at NASA's Dryden Flight Research Center, Edwards, California, from July 1966 to November 1975 to study and validate the concept of safely maneuvering and landing a low lift-over-drag vehicle designed for re-entry from space. This year, NASA will launch its final space shuttle missions. The development of the shuttle had sprung from the supersonic rocket planes of Chuck Yeager, and was an answer to the question: What is the best way to send man into space? Chuck Yeager and the Bell X-1. NASA began flight-testing experimental lifting bodies at Edwards in the 1960s, following evolution of the concept earlier in the 1950s. A lifting body is a fuselage that generates lift at the expense ofhigher drag. It uses a modification of the “blunt body” principle developed by H. Julian Allen at NASA’s Ames Research Center. Allen had showed in the early 1950s that a blunt body produced a detached shock wave that carried away ninety percent of the heat of re-entry. A lifting body is a tailored blunt body shape that uses this principle to survive re-entry, but which also has a high degree of streamlining and shaping so that it can generate lift, and fly through the atmosphere rather than plunging through it like a capsule. Von Braun's concept for a re-usable spaceship (Collier’s magazine cover from 1952). This hybrid approach optimises all phases of flight - subsonic, supersonic, and hypersonic, including spacecraft re-entry. And all of these flight regimes are required for a true space plane. The lifting body research was conducted at NASA's Dryden Flight Research Center based at Edwards. The engineer in charge was Dale Reed, whose first full-size model was the NASA M2-F1, an unpowered craft based on an Ames body shape but made of wood. Initial tests were performed by towing the M2-F1 along an Edwards dry lakebed behind a modified Pontiac Catalina. The M2-F1 was soon nicknamed the "Flying Bathtub". In 1966, NASA began test flights with heavier rocket-powered lifting bodies which were air-launched from under the starboard wing of a B-52. All used the XLR-11 rocket engine that Yeager had used on his epochal flight. The Northrop HL-10, and the Air Force X-24A and X-24B were just some of the weird and wonderful designs that were tested. Most of the general public had never heard of these lifting body designs until watching the 1970s television show “The Six Million Dollar Man” in which real footage of the test pilot Bruce Petersen showed him crashing his Northrop M2-F2 after a combination of high pilot workload and stability and control problems caused it to ‘auger in’ (in flight-test parlance) to the baked desert floor at Edwards. The lifting body experiments were vital. This classic 1969 photo shows the Dryden NB-52B flying over the HL-10 lifting body aircraft and its pilot, Bill Dana. NASA formally adopted the shuttle program in 1969 during the heady days of the Apollo program’s first success. Two NASA centers – Marshall (Huntsville) and Johnson Space Center (Houston) - oversaw the construction of the space shuttle which was actually built by Rockwell in California. A 1960 concept image of the US Air Force's proposed Manned Orbiting Laboratory. The station's configuration was that of a two-person Gemini B spacecraft that could be attached to a laboratory vehicle. The program was cancelled by Defence Secretary Melvin R. Laird in 1969 after the estimated cost of the program had risen in excess of billion, and had already spent .3 billion. Some of the military astronauts selected for the program then transferred to NASA and became some of the first people to fly the Space Shuttle. Essentially the space shuttle was comprised of four main subsystems: solid rocket boosters, external tank, mainengines,andorbiter. Marshall, the base of Wehner von Braun, oversaw the construction of all but the orbiter, which was designed by Houston. It was envisaged that the main role of the space shuttle would be servicing a large civilian space station that would be funded at a later date, perhaps sometime in the 1980s. But in the late 1960s a military station - the Manned Orbiting Laboratory (MOL) – was already being designed by the Air Force. A team of fourteen military pilots were in training to fly the shuttle to and from the MOL, one of whom was former Naval Aviator and Edwards Test Pilot School alumnus Bob Crippen. In 1967 Crippen and the other astronaut candidates for the post Apollo era had been given a stark choice – choose between the DOD or NASA. Since NASA’s future beyond Apollo was uncertain (the space shuttle would not be green-lit until 1972), Crippen made the decision to go to the DOD to work on the MOL program. But in a date that is clearly engraved on his mind he told me that the MOL project was canned on June 10, 1969 – only a month before Armstrong and Aldrin would walk on the moon. The cancellation of the MOL projects was a direct consequence of the costs of the MOL program and the inescapable fact that advances in technology were already indicating that machines could soon perform many of the tasks that had been envisaged for the military personnel aboard MOL. In a bitter blow to the young astronaut, Deke Slayton, then Director of Flight Operations, told Crippen that now that the Apollo program was finished he did not have anything for him to fly – and Crippen knew that the space shuttle would not leave the launch pad until at least 1980. So there were many long years to fill, but Crippen put them to good use. As the years went by and the space shuttle meandered through its long development, Crippen worked on the projects that were spun out from Apollo – Skylab and Apollo-Soyuz. Crucially, he also worked on the vital heart of the space shuttle - its computer systems. By the time the space shuttle was almost ready to fly, John Young had taken over from Tom Stafford as the Chief of the Astronaut Office, and he and Crippen were working together. John Young and Bob Crippen flew on the Shuttle program's maiden flight in 1981. It was an association that was to develop into friendship. As Chief Astronaut it was likely that Young would be commander of the first shuttle mission. Enterprise (the version of the shuttle that was used for landing tests) at Ellington Air Force base. Abbey said to him “Crip, how would you like to fly the first shuttle?” As Bob Crippen told me, he was ready to turn handsprings at that point. Crippen was appointed Pilot on STS-1, the inaugural shuttle flight. The Commander - as he had correctly predicted - was John Young. It was almost time for the first launch of America’s first reusable spacecraft. Read Part 1 of this story, which reviews the origins of the U.S. military's rocket plane and space plane efforts. This story was provided to SPACE.com by Astrobiology Magazine.